William Cheselden (1688-1752) was a successful London surgeon who gained fame from his skill as a lithotomist: he had perfected the art of cutting out bladder stones in minutes rather than hours. 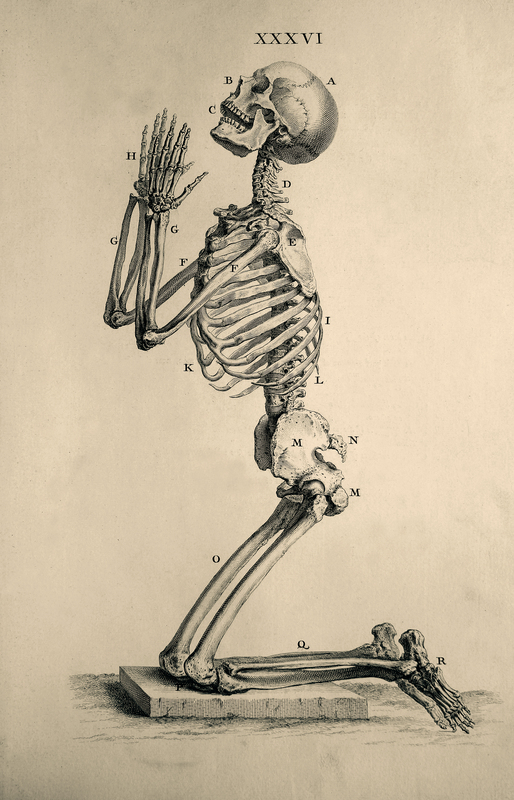 This illustration ‘The Praying Skeleton’ is from his Osteographia (1733). Most of the engravings in the volume are quirky. Various animal skeletons are depicted in addition to the human ones. There is no doubt that the engravings are beautifully executed, and the book was large and expensive, with little explanatory text, which suggests that its target was the wealthy ‘general reader’. William Cheselden, “Osteographia, or the Anatomy of Bones,” ourheritage.ac.nz | OUR Heritage, accessed April 22, 2019, http://otago.ourheritage.ac.nz/items/show/11078.